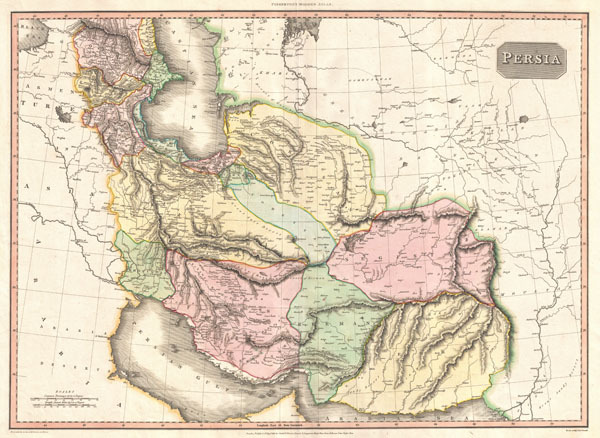 An exceptionally attractive example of John Pinkerton's rare 1811 map of Persia. Covers from the Black Sea in the northwest to Fergana in the northeast, to the Arabian Desert in the southwest to the Mouths of the Indus in the southeast. Roughly includes the modern day nations of Iraq, Iran, Afghanistan and Pakistan. We cannot praise Pinkerton's cartographic work sufficiently. This masterful map offers extraordinary detail, fine engraving, and delicate color work. Pinkerton emerged as one of the preeminent cartographers of an important transitional period wherein the decorative elements common to 17th and 18th century cartography were being discarded in exchange for accuracy and detail. This map is no exception. Pinkerton details mountains, deserts, swamps, lakes and river systems. He shows offshore reefs and banks in the Persian Gulf and the Arabian Sea. He also notes numerous towns, villages and even castles. Lake Van, in what is today eastern Turkey (ancient Armenia ), Pinkerton labels 'doubtful,' though it does in fact exist. Near Van we can also find Mt. Ararat and the ruins of several ancient cities. Further south Pinkerton notes the Ruins of Babylon, Bagdad, and Bossra. Altogether a fine and extraordinary map. Drawn under the direction of John Pinkerton by L. Herbert for issue as plate no. 35 in the 1815 Cadell & Davies issue of Pinkerton's Modern Atlas. Dated September 1st, 1811. Pinkerton, J., Pinkerton's Modern Atlas, 1815. Very good. Original centerfold. Wide clean margins. Blank on verso. Rumsey 0732.037. Phillips (Atlases) 724.